Once both the text analytics installation and first time setup are completed, you can use one of the out-of-the-box templates to validate that your text analytics implementation is operational. 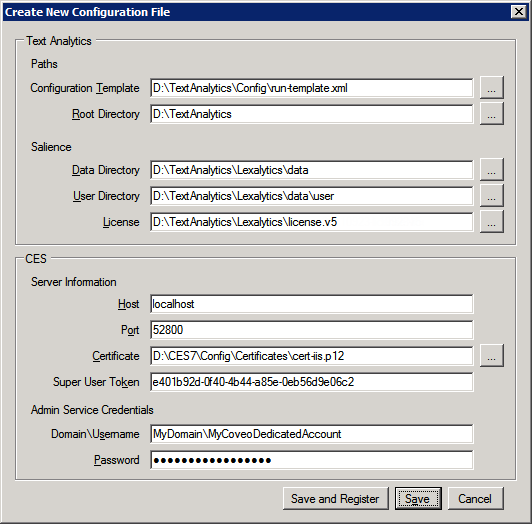 Using an administrator account, connect to the server on which the Text Analytics module is installed. Start TAnGO (see Starting TAnGO). In TAnGO, click Create Configuration File. In the Text Analytics section, under Paths, in the Configuration Template box, browse to select one of the out-of-the-box run or job templates available in the [Text_Analytics_Path]\Config\ folder. Example: By default, the run-Template.xml file extracts themes, places, person names, and company names, and then tags documents containing those using new tag fields (@txtantheme, @txtantheme, @txtanplace, @txtanperson, and @txtancompany). In the Save Configuration File as dialog box, browse to the [Text_Analytics_Path]\Config\ folder, in the File name box enter a name of your choice (ex: run-TemplateTest), and then click Save. 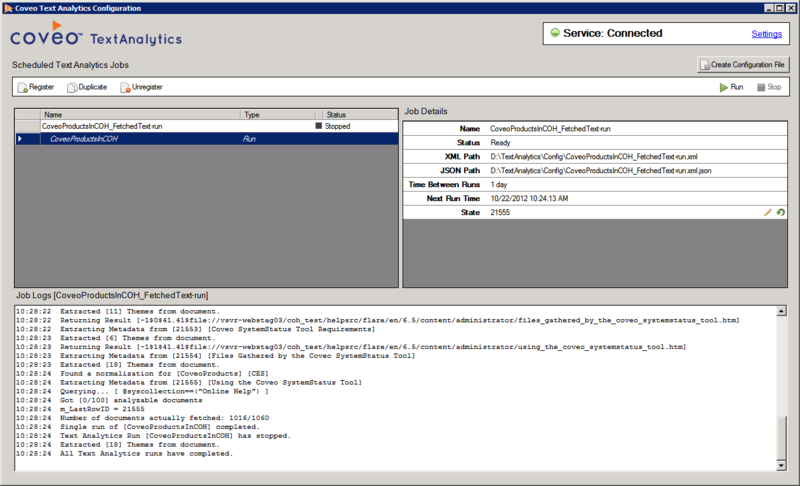 In the top-left panel, click your run or job to see its state in the Job Details panel. When the run or job starts following the time interval schedule, in the Job Logs panel, verify that logged activities appear to run smoothly. If error messages appear, review the installation and first time setup steps to fix them (see Installing the Text Analytics Module and Performing the First Time Setup of the Text Analytics Module). Take advantage of text analytics output in your .NET search interface by adding facets based on the newly created tag fields (see Adding or Customizing a Facet With the .NET Interface Editor).